Pictured above: Louis in the cellar gathering Rieslings from barrels for blending trials of the 2017 vintage. 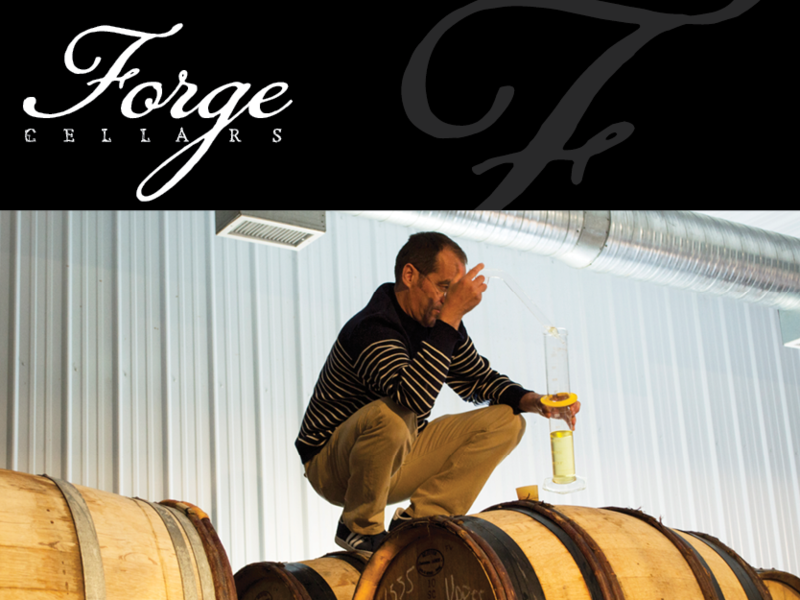 It has been a quiet winter in the cellar and on the eastern slopes of Seneca Lake. There is a calmness that you can feel in the winery as you pass through racks of barrels playing soothing songs of fermentation. Allowing our wines to ferment slowly and spontaneously makes for a long winter of watching and waiting, but the reward at the end makes the anticipation worth it. As a result of this natural fermentation, we find that wines are more aromatic and expressive. In 2018, we expanded to working with 16 different sites along a small eight mile stretch of southeast Seneca Lake. The variations in soils, slope, elevation, and growing practices make this landscape a true treasure of terroir. It is our hope that we can very clearly show you this in the wines from 2018, which will begin to come available in the summer of 2019. A true pleasure has been watching the evolution of the first wines produced from fruit on our Home Farm. We harvested a small amount of Riesling and Pinot Noir in 2018--both stunning in terms of quality and flavor. As we continue to check in and taste them throughout fermentation, they are by consensus, spectacular examples of transparent, honest grape-growing, and speak ofterroir impeccably. They have been a wonderful case study for us, as we put an inordinate amount of effort into caring for the vines with the help of Autumn Stoscheck in 2018, and are sure they will be an incredible addition to our blends. In the January 2019 issue of Wine Spectator, our complete lineup of 2016 Dry Rieslings was featured among the high ratings from New York, dominating the Riesling category. At this time, we still have a small amount of 2016 Dry Riesling Les Alliés available, however the rest of the vintage has sold out. If you are among the lucky ones who have a few bottles of Peach Orchard or Breakneck Creek Rieslings resting in your cellar, you will be happy to read the reviews and thankful that you had the opportunity to add a few to your collection before they were sold out. One of our most iconic wines, our late-release single vineyard Riesling from Leidenfrost, is still available in limited quantities. Single vineyard wines are typically released in the summer and produced in limited quantities. While we do bottle small lots of certain vineyards separately each vintage, the reason we make so few of these wines is because the fruit from these sites are also components in the Classique and Les Alliés bottlings each year. Every time you enjoy a glass of Classique or Les Alliés, know that you are also tasting a piece of these special vineyard sites, too. These single vineyard wines tend to sell very quickly and are adored by the press, so we always suggest stocking up when they are first released. As a subscriber to this newsletter, you are among the first to know of their release, and we will be sure to reach out this summer when the 2018 vintage becomes available. I have struggled to write this post over the last few days. Usually when you get good scores from a national publication the first thing you do is to run to the top of the highest mountain and yell at the top of your lungs. After all, it feels great to receive recognition for your hard work, because if you know anything about the wine business you are not doing it for the money. So we received great scores but I just didn’t have it in me to spread the news. Why? Well, I think it took a few days to know why and it is very simply this. Crestwood. Crestwood you ask? Yes, the company that wants to store pressurized gas under Seneca Lake in old salt caverns. Want to know the details? Check out Gas Free Seneca. In a nutshell we have an out of state company that wants to put a gas storage hub along the west side of Seneca Lake and then pump pressurized gas into caverns UNDER the lake. Yes, it is as crazy as it sounds. And if you take the time, I hope you do, to read more you will see it borders on the insane. So why did I have a tough time posting the reviews? Because there are people in our industry that 1) think it is okay or 2) refuse to talk about it because of the blowback. At a time when we are really hitting our stride (see the reviews below) our biggest challenge is not with other regions in the world producing, in this case Riesling, but with a Texas company who wants to jeopardize our lake and our communities. And what is worse is that we actually have people in the industry that are on their side. Every year we gain more recognition, every year we make a bit more wine, every year we continue to develop vineyards and renovate or build new buildings, every year more people come to witness the beauty of the Finger Lakes, every year our reach grows internationally. But every day we must devote a portion of our day to defeating Crestwood and the risk it poses to our region. Imagine what we could do if our energies were solely devoted to continuing to make this region realize all of the potential of its land and its people in a way that doesn’t directly threaten what is great about it. Pure, with yellow apple, anise, honeysuckle and jasmine notes that glisten through the long, racy finish. Shows length, cut and precision. A delicious sweetie, with orange zest, date, maple and quince flavors that show excellent focus and zip through the unctuous finish. An enticing sweet wine, with lush mango, creamed apricot and candied orange peel notes melding together and carrying through the maple-accented finish. Juicy and engaging, with ginger, peach and yellow apple notes, back by a racy melon rind edge through the finish. Solid. A taut, dry style, with pure lime, kiwifruit and pippin apple flavors backed by a slate note that gives the finish good tension and length. Very solid. A BEST BUY. Let Governor Cuomo know you support the Finger Lakes wine industry today and tomorrow by signing this petition.